The Yates Mansion in the Schenectady's Stockade neighborhood, shown here on Thursday, is up for sale again. 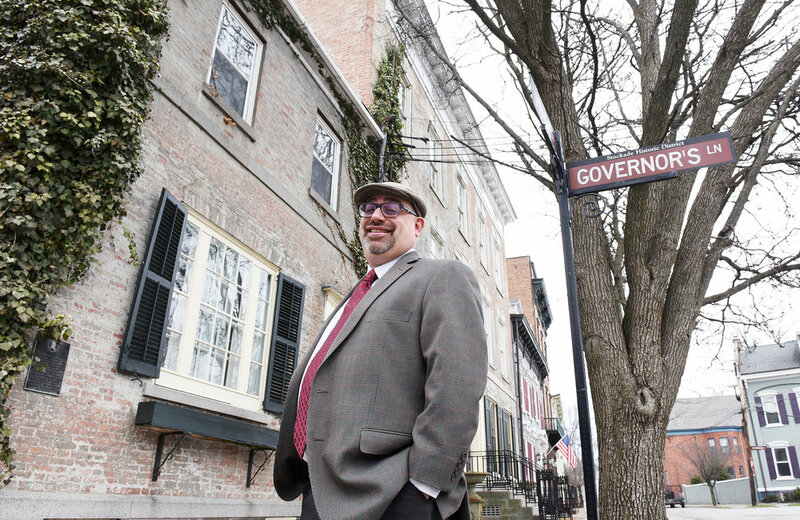 SCHENECTADY — People love touring the large house at 17 Front Street in the Stockade, once the home of Governor Joseph Yates back in the early 19th century. Nobody, however, seems too interested in buying the building. The house was originally a two-story Federal-style home with a one-story left wing and a separate entrance that Yates used as his office. A third floor was built over the main frame in the early 20th century, and Gil Harlowe added a second floor over the left wing when he bought the building in 1941. There are currently seven different apartment units in the building and two garages along the west side of the building on Governors Lane. The backyard is enclosed by a tall stockade-like fence covered with ivy. Famous visitors include the Marquis de Lafayette, Martin Van Buren, Aaron Burr in the early 19th century and actress Donna Reed in the 1950s. A 20-by-60-foot swimming pool in the backyard is no longer in use. "I put it on the market, I took it off the market and then my Realtor asked me to put it back on," said Ron Chard, a Rexford resident who owns the historic property. "I've had maybe 165 people come and look at it but nobody in Schenectady has the money. People love looking at it but nobody has made me an offer." Along with being the home of Schenectady's only governor back in the 1820s, the Yates House was owned by Gil Harlow for nearly 75 years. A former civil engineering professor at Union College, Harlow bought the house from Dr. Glen Smith in 1941 and lived there for 70 years. He passed away in November 2014 at the age of 100. It currently consists of seven separate apartments and all of them are occupied. Chard did plenty of renovation on the livings spaces when he purchased the building from Harlow's daughter, Priscilla Gocha, back in 2012. "It's one of the most famous buildings in the Stockade, and it really is quite wonderful inside," said Chard. "There are new kitchens in all of them, and I totally redid five of the seven apartments when I bought the place from Priscilla." Chard's purchase price from Gocha was $700,000 seven years ago. When Chard listed it earlier this year the asking price was $1.1 million. That figure has come down to $899,000. Gocha spent most of her young life growing up in the house, and later lived in the third floor apartment with her husband, Bill. "It got to the point where Bill and I just couldn't take care of it," said Gocha, whose husband passed away in 2017. "We sold it when my father died, but we kept living there for a while. It's expensive to keep up with very high taxes. I loved the house, but it was just too much work." Front of Yates Mansion in the Stockades which is up for sale again, in Schenectady on Thursday, April 11, 2019. The house was built by Tobias Van Eyck in 1760 and designed by Samuel Fuller, one of the leading architects of his day. 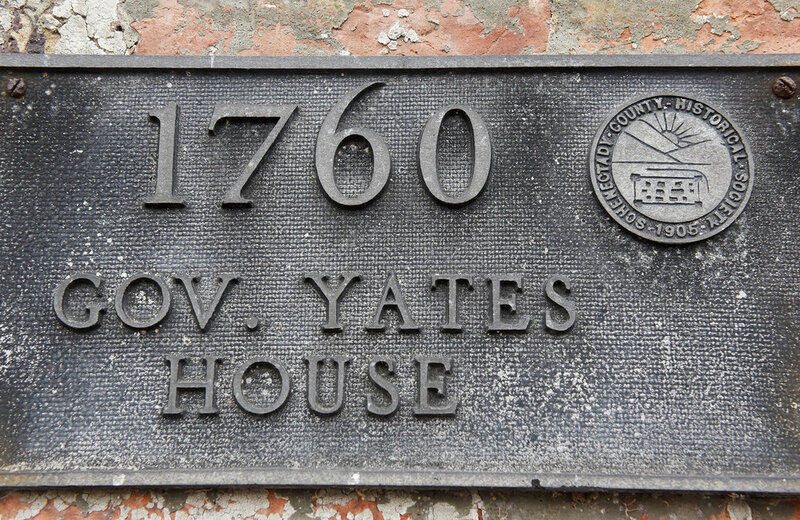 Yates, who was born nearby at 26 Front St., moved into the home a few years before he was elected governor of New York in 1822. The Yates' name is also connected to two other historic structures in Schenectady County. The Yates House just around the corner on Union Street, reputed to be the oldest house in Schenectady (1705-1710), belonged to an uncle, Abraham Yates, and the Yates Mansion in Glenville was built by Joseph's grandfather, also named Joseph. "He was a compromise candidate when New York's governor, DeWitt Clinton, didn't run for a third term," said Schenectady City Historian Chris Leonard said of Yates. "He was a likable guy who didn't make too many enemies and that's why he crushed his opponent in the election." Yates took 97 percent of the vote in 1822, but during his two years in office his popularity dipped drastically due to patronage issues and an argument over popular elections. He also fell out of favor with his party's political boss, Martin Van Buren, who would go on to become governor of the state and U.S. President. "He came from a very prominent Schenectady family, but when he became governor it was under a new state constitution that changed his term to just two years," said Leonard. "He suddenly was the guy making all these patronage appointments and certain people became very angry with him when he didn't pick their people. He suddenly had all these enemies so he decided not to run for a second term." City of Schenectady City Historian Chris Leonard stands in front of Yates Mansion in the Stockades which is up for sale again, in Schenectady on Thursday, April 11, 2019. Yates' father, Christopher Yates, was a key military figure during the French and Indian War and the American Revolution. Joseph was named the first mayor of Schenectady in 1798 and served 12 one-year terms. He was also a state senator and a judge on the state supreme court. He was also one of the dignitaries on the initial run of the Mohawk-Hudson Railroad in September of 1831 from Albany to Schenectady. During Yates' time at the house, he was visited by such dignitaries as Van Buren, Aaron Burr and the Marquis de Lafayette. Much later, during World War II and throughout much of the 1950s, Harlow's house was also called the University Club because he rented out bedrooms to recent college graduates embarking on an engineering career at nearby General Electric. Sometimes as many as 36 GE employees were sharing bedrooms in the house according to Gocha, who remembers how the house bustled with energy in those days. One of the tenants was a young engineer by the name of Pete Converse, who started his own sneaker company, and another was Keith Mullinger, whose older sister, the actress Donna Reed, visited him for a Christmas party at the house back in the early 1950s. "I have so many wonderful memories," said Gocha. "It was hard to sell it, but no one in the family wanted to take it on." The Gov. Yates House was also known for its backyard that included a three-level terrace garden and a swimming pool. It stretched nearly down to the Mohawk River but hasn't really recovered since much of it was damaged by water during Hurricane Irene in 2011. "The pool's filtration system was wiped out by the flooding," said Chard. "It's not the same, but I have a man that cuts the grass and it still looks nice. A couple of years ago I went down to Atlantic City and bought a fountain from Trump's Taj Mahal and put it in back. I enjoy the backyard myself. I tell the tenants it's under construction."